GARY—Fed up with a minimum wage of just $7.25/hour and corporate attacks on local jobs and union rights, scores of Hoosiers rallied on Saturday to “Get Out the Vote” for a minimum wage increase that will bring jobs and economic activity back to northwestern Indiana. The crowd of northwest Indiana residents and local elected officials and candidates heard from several low-wage workers about the devastating impact of low wages and what was at stake for them in the November elections. 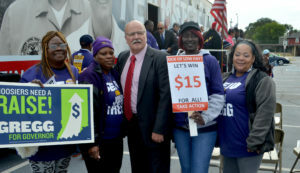 John Gregg, the Democratic candidate for Indiana Governor, pledged his support for raising the minimum wage to an enthusiastic crowd and urged everyone in attendance to vote on November 8. 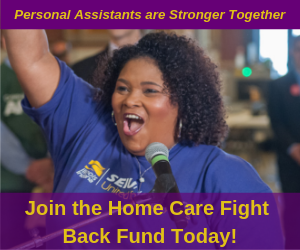 The rally was organized by SEIU Healthcare Illinois Indiana, a union representing thousands of healthcare workers across Indiana, in conjunction with other labor organizations, faith leaders, and community advocates from northwestern Indiana. Additional speakers included Lake County Assessor Jerome Prince, Reverend John Jackson of Trinity United Church of Christ, and Dan Murchek from the Northwest Indiana Federation of Labor. Following the rally, dozens of union members and community residents knocked on doors in Gary to encourage early voting among households concerned with low wages and high unemployment in the region. Above: SEIU Healthcare members with John Gregg, Democratic candidate for Indiana Governor.